I remember my last years of High School as ones filled with hope and excitement. I knew which college I hoped to attend but was stuck in a financial jam. I had no savings, no RESP, and no one to help me with college tuition. After investigating my financial aid options, I realized my best option was to leave home and go to another province to study. There were more support opportunities for out of province students because we were no longer dependant on our parents once out of arms reach so to speak. It was a hard decision and hind sight is often filled with "I wish I had known". I ended up setting in motion a 15 year battle with debt. Before setting out to Ontario, I chose to work for two years after High School and saved enough for travel expenses and some savings. Every semester I lined up in the college financial aid office and signed over my student loan money order and signed a little piece of my future away. After 4 years of working hard towards a Bachelor's Degree, I graduated in 1999 with more than $30, 000 debt. I got married to my college sweetheart a week later so we now had a combined student loan debt of $65,000. Doesn't that sound like a great way to start a marriage? Fast forward to 2009, we had a lovely baby girl and by the time she was a year old I was still paying for my student loan. By the time she was five, our student loans were finally paid off and we opened a high interest savings account for us and a family member opened a RESP for our girl. I am fanatical about stopping the cycle of debt. This is modelled in having a debt free life. I only use my credit card to get points on purchases I already have the cash to pay for. I want my girl to realize her hopes and dreams and make life long friendships in college without a cloud of debt hanging over her future. You can download your free RESP Booklet today or book and appointment with a RBC RESP customer service professional. Did you know that $25 a week can change your child's future? "Even small contributions add up quickly with an RESP-Matic: Set up regular contributions and see your savings add up! 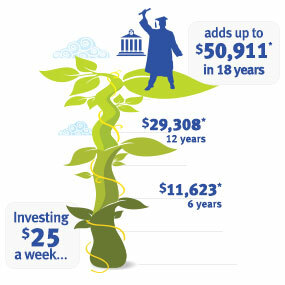 $25/week can add up to $50,911 in 18 years"
There are many reasons to open an RESP. It is easier than ever with the option to do automatic contributions. There are also free top ups available for your RESP. The government will give up to $7200 in grants towards your RESP depending on how much you contribute. I encourage you to make an appointment to discuss your saving options. Even if you don't have $20 a week to spare, setting a savings plan in motion can make a big difference in the lives of your loved ones later on. Disclosure: This is a sponsored post. All opinions and personal anecdotes remain honest and my own. Images are owned by RBC CANADA and are used with permission.